During talks this week with Saudi Arabia and the Syrian opposition, Russian officials called for a political deal to lay the basis for the stabilization of Syria, proposing the formation of a new national unity government involving elements of the Assad regime, the Syrian opposition, and Kurdish and Iraqi forces. “The talks focused on coordinating all those who are already fighting terrorists so that they put their main focus on fighting terrorism and leave for later settling scores between themselves,” Russian Foreign Minister Sergei Lavrov said in public remarks after discussions with the Saudi leadership. Russia’s intervention would aim to “help all Syrians unite over the core task of preserving their country, ensuring stability and preventing it from becoming a hotbed of terrorism and other threats,” Lavrov said. “We agreed to continue thinking about steps that should be taken to create a suitable environment to resume dialogue between the Syrian government and all other Syrian groups,” Lavrov said, referring to discussions with Saudi Foreign Minister Adel al-Jubeir earlier this week. Russian officials have been able to reach “common ground” with US and Saudi representatives during recent meetings, according to Lavrov, with Russian and Saudi officials agreeing to sponsor new negotiations between the Syrian government and the opposition. Speaking for the Saudi monarchy, Foreign Minister al-Jubeir ruled out any cooperation with the Syrian government. “As for a coalition in which Saudi Arabia would participate with the government of Syria, then we need to exclude that. It is not part of our plans,” Jubeir said. “Our position has not changed… there is no place for Assad in the future of Syria.” Saudi Arabia, together with Qatar and Turkey, has been one of the principal sources of funding and support for ISIS, the al-Nusra Front and other Islamist militias. Discussions with US Secretary of State John Kerry last week focused on a deal to “unite the efforts of our two countries and other countries in the region more effectively,” the Russian Foreign Minister said in remarks to the media. In talks with the Syrian National Council leadership Thursday, Lavrov declared that Russia is prepared to back a political coalition that could include elements of the Syrian opposition, as well as Kurdish forces and other elements of the Syrian and Iraqi militaries. In a sudden reversal, Moscow acquiesced last week to longstanding US demands for insertion of chemical weapons inspectors. According to analysts and government officials, Moscow’s turn to negotiations stems from the fact that, behind closed doors, Putin’s leadership now believes that Assad’s removal is virtually inevitable. Having supported the regime politically and militarily against the US-engineered insurgency since 2011, Moscow is now seeking to salvage the situation. 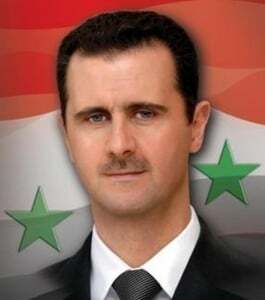 “He is no longer of the opinion that Russia will support Assad to the end. I believe he can give up Assad,” Turkish President Recep Erdogan said last week in reference to discussions with Russian President Vladimir Putin. “I think that Moscow, at its heart, accepted as positive fact the end of Assad’s regime and is trying to save all that may be saved after the collapse,” chairman of the Islamic Committee of Russia Geydar Dzhemal told Voice of America. “Officially, Moscow has not rejected unwavering support for the Damascus government,” Alexander Shumilin of the Institute for US and Canada Studies told Voice of America. “But the situation around Syria is changing now, and Moscow is trying to adapt to this new, emerging situation,” Shumilin said. The Russian initiatives are part of a flurry of diplomatic maneuvering over the fate of the besieged Syrian government that has gained momentum in recent weeks. On Wednesday, Iranian Foreign Minister Javad Zarif discussed proposals for the formation of a transitional unity government with Syrian President Bashar al Assad during an official diplomatic visit. Reports emerged Thursday of several truces brokered by Tehran during direct talks with one of the most influential al Qaeda-linked factions in Syria, known as Ahrar Al-Sham. The cease-fire terms include 48-hour pauses in fighting in the Damascus suburb of Zabadani and in two towns in the northern province of Idlib, Fuaa and Kafraya. The initial truce agreements may become the basis for a longer-term deal to end hostilities in larger areas of the country, according to Iranian officials. Other regional players are similarly pushing for a multilateral deal aimed at the formation of a new regime, as part of negotiations coordinated by the Putin government this week. “Confronting terrorism requires a transitional body that brings together all Syrians,” Syrian National Coalition (SNC) member Hisham Marwa told press in advance of meetings with Putin. “Victory against IS will come with political change in Syria that will unify all Syrian forces,” said Haytham Manna of the Cairo Conference Committee (CCC). The CCC has advanced its own proposal for the creation of new committees including both opposition and Syrian government representatives, as the basis for a political and security framework leading to the installation of a transitional government. US-aligned regional governments similarly voiced support for a deal over Syria this week. “The international community should exert more efforts to find a political solution to the situation in Syria,” Jordan’s Prime Minister Abdullah Ensour said on Wednesday during a joint appearance with Lebanese premier Tamam Salam. The Syrian government declared its commitment to negotiations Thursday, while continuing to insist publicly on its own plan for a transitional regime, which would retain Assad in power as head of state until 2021, but also incorporate elements of the opposition into the state structure. “The Syrian government is ready to be a major party in negotiations that will lead to a settlement that will meet and satisfy the needs and aspirations of the Syrian people,” Syrian Deputy Foreign Minister told CNN Thursday. As talks proceed, developments on the ground are underscoring that any diplomatic settlement over Syria will be implemented through a militarized carve-up of the country, spearheaded by the Pentagon and its regional partners and proxy forces. As part of a deal reached in July between Ankara and Washington, Turkish President and Justice and Development Party (AKP) government leader Recep Tayyip Erdogan gained US backing for the imposition of a militarized “buffer zone” encompassing hundreds of square miles in northern Syria. The new zone would be occupied by Syrian opposition fighters and reinforced by the US and Turkish air forces, with US forces having been cleared to operate from Turkish bases as part of the agreement. Once established, the military zone would serve as a staging area for US-backed rebel forces fighting against the Assad government. Despite their public confidence in Putin’s readiness to accept a deal, the Turkish government is clearly preparing its own large-scale military intervention into areas of northern Syria. Plans leaked in July showed that the Turkish government was on the verge of launching a massive invasion of northern Syrian with a force of some 18,000 soldiers, with the full-scale invasion being postponed largely out of concerns over domestic unrest. Turkish forces remain massed along the border, prepared to launch incursions that would inevitably draw Turkey into fighting with Kurdish forces in northern Syria. The Jordanian government, which maintains close relations with the Central Intelligence Agency and the Pentagon’s Special Operations Command (SOCOM), has already declared its plans to conquer its own enclave in southern Syrian, announcing an imminent invasion, to be led by a newly trained special forces brigade, on June 29, before backing off at the last moment. The US-led war coalition planned to provide “behind-the-lines” military support for the Jordanian operation, according the Financial Times . On Wednesday, amid the ongoing negotiations, US warplanes launched their first manned combat missions against Syrian territory from Turkish bases. The US pilots entered Syrian airspace armed with an expanded targeting authorization, including discretion to target Syrian government forces, signed by President Obama on July 31. US planes carried out large-scale strikes near Aleppo, Hasakah and Dayr Az Zawr, according to a statement from the US-led Combined Joint Task Force Operation Inherent Resolve, launching at least 24 strikes against Syria and Iraq on Wednesday alone. One of these US air strikes, targeting the village of Atmeh, killed eight civilians, including at least five children ages four through 10 and two women, the Syrian Observatory for Human Rights reported.